With Safari on the team we're consistently running into the best problem ever: his interpretations of what we've planned or written push us beyond what we'd ever imagined. See... When planning out some of the monsters that appear on the islands, we got kind of lazy. 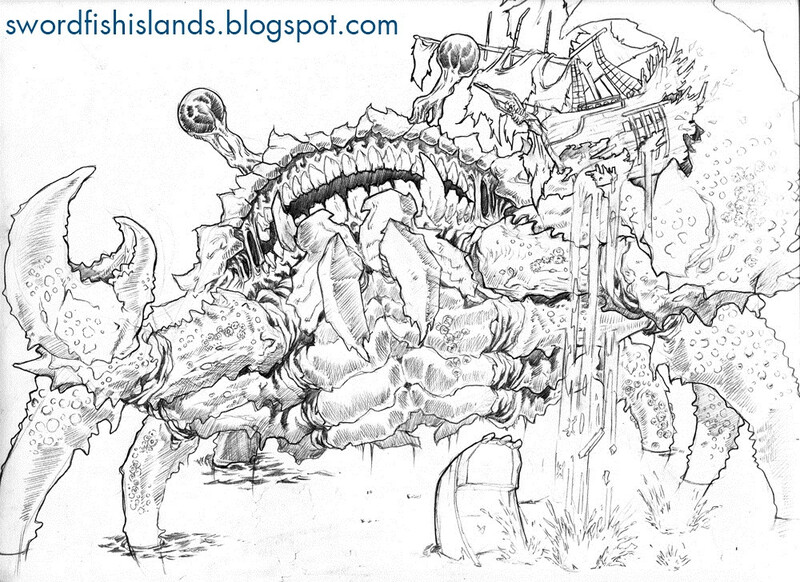 We didn't mean to, but we fell into unimaginative tropes and put "Giant Crab" on the list o' monsters. Runescape did it. Skyrim did it. WoW did it. Mega Man did it. Why not us? Giant Crabs are all over the place (including your mom's pants). They fit the bill. Got a beach? Need fodder? How about crabs? Basic. Simple. Safari, as it turns out, was having none of that. He came back with a galley crushing monstrosity of absolutely gargantuan proportions, with human teeth. The Diviner, Wintergreen and I were ashamed of ourselves. The Swordfish Islands doesn't have room for common "fodder". What had we been thinking? We knew better. And once again, Safari took something that'd we'd included as an aside, and made it badass. Dear nature, thanks for being scary.